Moses, a man of wisdom and strength raised his staff and crushed an empire. This is his story "The story of the Exodus or flight of the Hebrews from Egypt to escape persecution is told in a perspective which highlights Moses' efforts to persuade first the stubborn Pharoah Merneptah, who was his adopted cousin, to release to release the Hebrew slaves he was using to build his empire. Spectacular story produced with all-star-cast including Burt Lancaster as Moses, Anthony Quayle as Aaron, Ingrid Thulin as Miriam , Irene Papas as Zipporah and narrated by Richard Johnson. This timeless biblical tale deals with Moses, the Hebrew lawgiver, an extraordinary man who receives a holy calling, and follows his life from birth, abandonment, slavery and trials in leading the Jews through the Holy Land, leading the them out of Egypt. 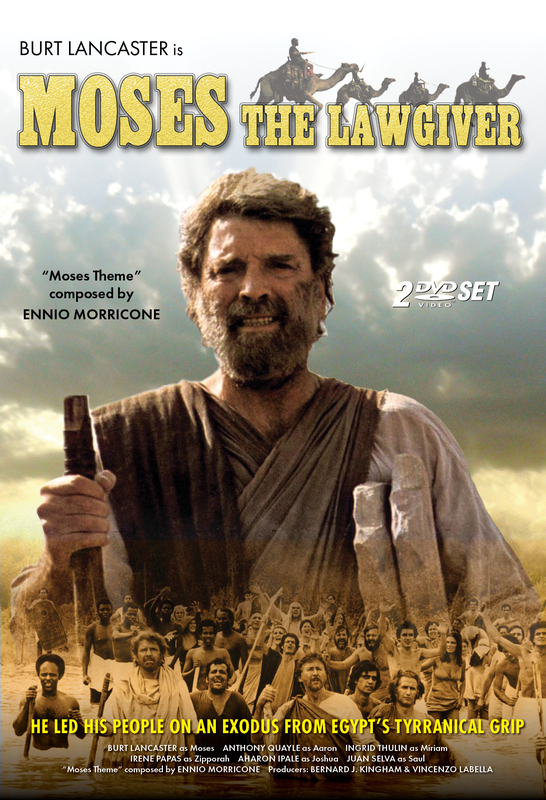 When Moses' Hebrew origin is revealed, he's cast out of Egypt and wanders across the desert. Returning to Egypt, Moses along with his brother Aaron, confront Pharaoh Mernefta, asking him to liberate the Jews but he refuses, causing God to inflict the 7 plagues on the Egyptians. Finally, Moses climbs the Mount of Sinai bringing down the holy tablets. This earthy and realistic film is shot on location in Israel's Negev Desert and Morocco. Anyone that loves the Bible or just appreciates a well produced historical piece will appreciate the production and the haunting and evocative score by Ennio Morricone. Evangelicals have become more vocal and involved in daily life and this film should appeal to them.